Instagram poets are all the fad these days and most of these writers have published works that reach fans all around the world. One of these poets is Rupi Kaur, whose debut book "Milk and Honey" sold over 2 million copies and has deemed a place on the New York Times Best-Seller List for 78 weeks. Recently, this encored with a hard-hitting (albeit cliche) collection of poems titled "The Sun and Her Flowers." I was taken aback by Kaur's first book as a woman from a similar background. She discusses feminism in ways which are often deemed taboo in Indian culture. But I must admit that she did, in fact, inspire me to also pen my own words down a few years ago. As far as the book goes, it's divided into five separate sections: Wilting, Falling, Rooting, Rising, and Blooming. 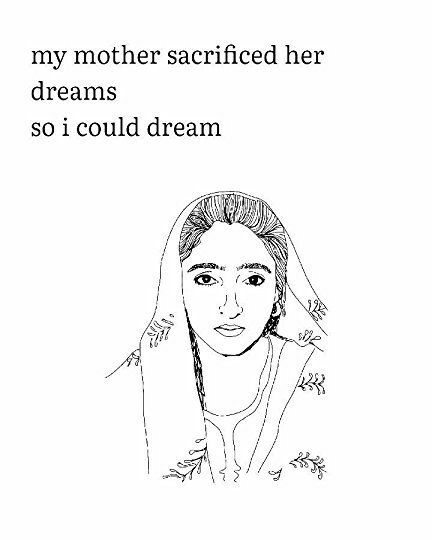 Although some of the sections do seem repetitive in that they seem to highlight and echo the same ideas that resonated in her first book, Kaur has dedicated one entire section to her parents and their struggle as immigrants. The section titled "Rooting" was one of my favorites. Kaur places her parents on a pedestal for all the sacrifices they have made and she acknowledges that these sacrifices would not have been necessary if she and her sisters hadn't come along. Kaur's mother, as painted with her words, is a perfect portrait of most — if not all — immigrant mothers. She states how her mother had to stay in India while her dad raised an income in Canada to support a family. This, by far, is the biggest sacrifice I have seen immigrant parents make. My own grandmother raised her daughters with the help of her mother, while my grandfather worked in the US to support his family. Kaur further silences all the immigrant kids for taunting their parents' accents. She writes: "so how dare you mock your mother / when she opens her mouth and / broken English spills out / don't be ashamed of the fact that / she split through countries to be here / so you wouldn't have to cross a shoreline..."
Kaur embraces her own accent as a marriage between her immigrant and "western" identity. Although this is my favorite section in the entire book (although there were poems that I did enjoy scattered throughout other sections as well), I don't think it has a place in this book. The book has this air of broken relationships and then this section pops in out of nowhere. Then, it eases back into mending relationships. It's almost as if this entire section was not intended for this collection, but rather an entirely different one dedicated solely to the topic of immigration. That being said, the book is, overall, amazing for anyone who is looking for a light, thought-provoking read.